Winnie Madikizela-Mandela - " Mother of the Nation" - SABC News - Breaking news, special reports, world, business, sport coverage of all South African current events. Africa's news leader. Winnie Madikizela-Mandela is a struggle icon who is renowned for being gutsy, she has tasted prison, banishment and harassment at the hands of the apartheid police – all for standing up against apartheid. She has lived the life of a widow who struggled to raise her children single-handedly while her husband, former President Nelson Mandela, was imprisoned. She has soldiered on as a political activist throughout the decades, sometimes rising, and sometimes falling. She is an African National Congress (ANC) veteran, an apartheid struggle stalwart and the former wife of former president Nelson Mandela, is a politician who has held several government positions and headed the ANC Women’s League. She was the first black medical social worker at Baragwaneth Hospital and is currently a member of the ANC’s National Executive Committee (NEC), after being absent from politics for years, following her convictions on murdered Stompie Moeketsi (1988) and fraud in 2003. She and Mandela divorced after he became the president in 1994, having separated two years prior to Mandela’s presidency. Madikizela-Mandela was never the first lady of South Africa although she was still married to Mandela at the time he became president in May 1994. Their divorce was finalised in 1996, with an unspecified out-of-court-settlement. Madikizela-Mandela’s attempt to obtain a settlement up to US$5 million, half of what she claimed her ex-husband was worth, was dismissed when she failed to appear at court for a financial settlement hearing. 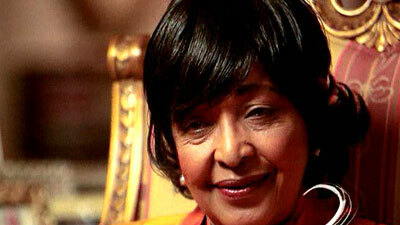 The two met and married in 1958 and had two daughters, Zinzi and Zenani Mandela.